We are delighted to invite you to download the new version of the ‘Safer Schools’ App. In today’s digital world it’s important for you to understand what children are doing on-line so you can help make them safer. This app has been designed to support and protect children by empowering them both at school and at home. Through their access, your children get access to information that is relevant to them and you will receive tips and advice on how to keep them safer online. You will get access to advice on topics relevant to make your home safer for children online including Age Restrictions, Screen Time and Safe Search Filters. We would like as many pupils and as carers as possible to download the app. The code for parents and carers is 5317. The code for pupils is 5543. 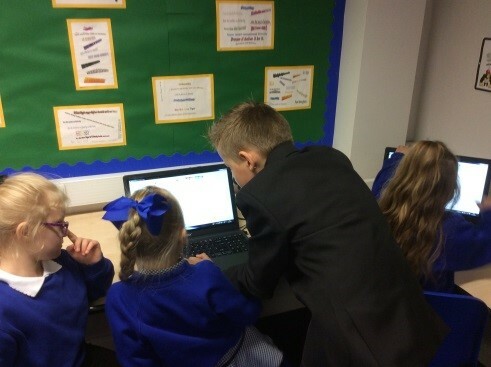 There was an excellent response from the children to become ICT digital leaders within our academy. The children had to submit an application form and the successful candidates were then interviewed! Once I again, the pupils of OSPA have impressed all with their skills and determination to succeed. 10 pupils were selected from the 40 children who took the time and effort to apply for these positions. 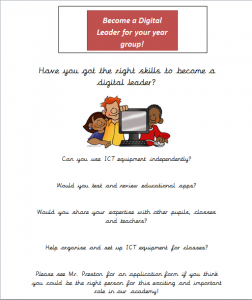 The 10 successful pupils will be issued with ‘Digital Leader’ badges and will play a prominent role in the development of ICT across the academy. A digital leader helping a KS1 pupil.